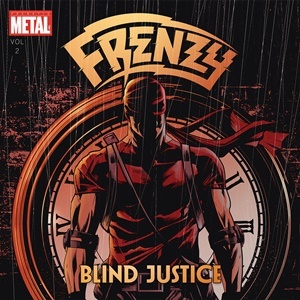 Melding together their affinities for traditional heavy metal and comic books/graphic novels, Frenzy create a throwback edge to their songwriting on Blind Justice that should find favor globally. Born in Madrid during 2015 and with their debut EP Lethal Protector issued to the public the following year, they’ve spent some time playing locally and across Europe, including festival appearances at Harder Than Steel, Pounding Metal, and Heavy Metal Maniacs among others. It’s evident immediately when checking out these eleven tracks that the band possess killer instincts, catchy twin guitar action, complimentary rhythm section work to drive home the grooves, plus a talented singer that can sing and scream to the heavens to tie the sound up in a steel casket primed for damage. The guitar interplay contains muscular riffs and enough bluesy textures against the exhilarating, electrifying lead breaks to convince anyone that Frenzy means business. Equal parts Accept, Judas Priest, and Racer X, along with a smattering of Dio and Rhoades-era Ozzy come to mind from Victor Diaz and Luis Pinedo axe attack when headbanging along to “Killing with a Smile” and “We Are the Future”. At times dipping into the primal helium capacity of Rob Halford and Sebastian Bach with a pinch of Don Dokken’s unique phrasing/personal touch, the vocal prowess of Anthony Stephen handles a mid-tempo anthem arrangement like “Save Me” just as easily as when his bandmates ramp up the proceedings in double kick power fashion for the aptly named “Velocity”. Taking storylines from Daredevil, From Hell, Silver Surfer, and X-Men among others, it’s the perfect marriage of superheroes and vigilantes against the energetic music – the cover art and band logo going hand in hand. The recording ends on the 6:38 “Shred or Die” that features every guitar trick in the book in a dual to the end, bringing to mind Malmsteen, Impellitteri, Van Halen, Randy Rhoads, with the back and forth ‘can you top this’ activities. Frenzy aren’t the fastest or flashiest in terms of their bare bones hooks and choruses – it’s very street-level in output to keep the proceedings moving along in a focused manner. But those who love the work of Skull Fist and Striker when it comes to newer bands will find this Spanish act very welcome in their playlists.